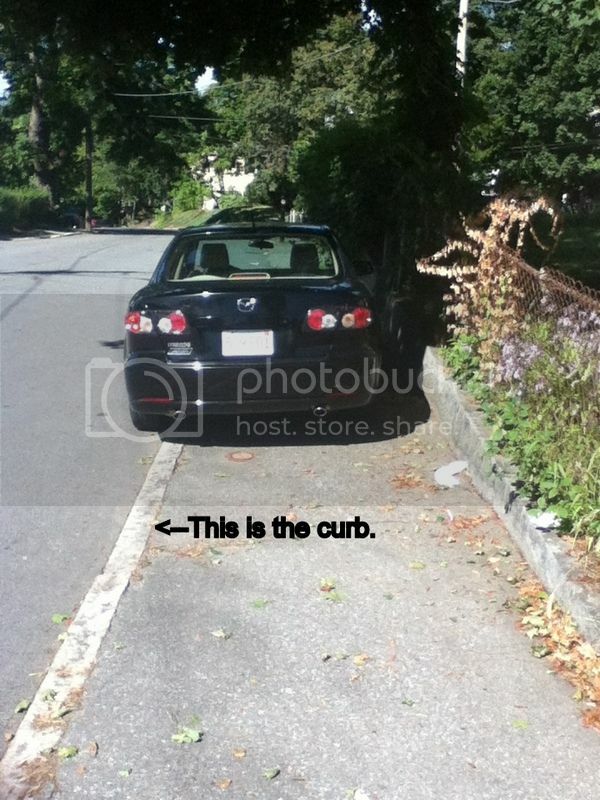 I helpfully pointed out the curb for you, because you might have thought that was a parking lane or something. And this car is parked here every day. The owner of this car considers this piece of sidewalk to be his or her assigned parking spot. It's not a very busy street; I actually never use it, so technically this car has never been in my way. But ask me if I care. That car is owned by the first person I ever asked to stop parking on the sidewalk. It is owned by a woman who said, "But I don't want my car to be hit," and then made a sort of face when I pointed out I couldn't get by, especially because of that giant tree she usually parked right next to, and she generously said that she would "try" not to park "so close" to the tree. 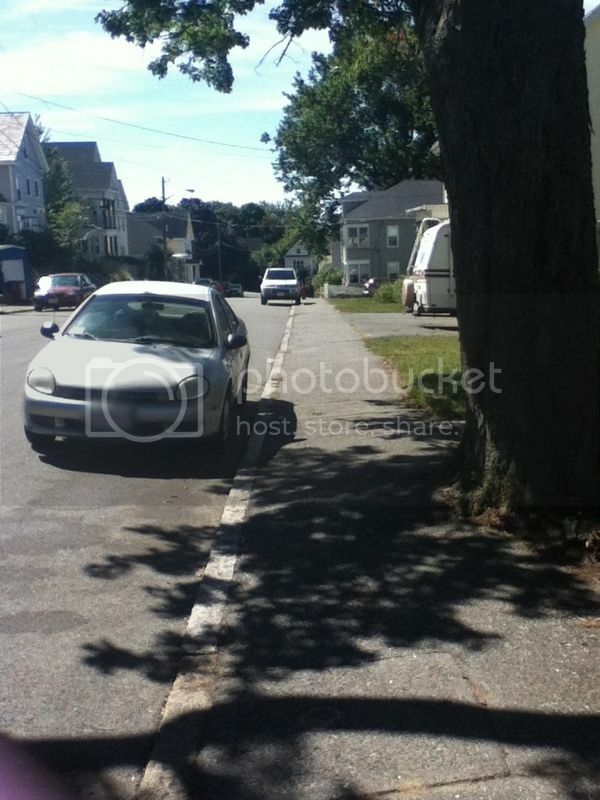 She then continued to park on the sidewalk every day. BUT NO MORE. I think she got a ticket. The guy who used to park on the sidewalk right behind her also stopped, and he is another one who told me that he doesn't want his car to get hit and that he "always parks there" and would not stop. TICKET. I have been in touch with a city councilwoman and she was putting me on the schedule for the council meeting on Sept. 24. So today I went out with my camera to gather more recent data and made a special trip down to the very busy street on which there used to be a five or so block stretch of cars blocking the sidewalk. But there were only a few cars still doing it! And then a cop saw me taking a photo and pulled over to talk to me. He told me I don't have to do that, because they put a notice in the paper warning people that they are going to start ticketing for this on Sept. 9. Police have received numerous complaints from residents about vehicles parked on sidewalks across the city. This is an issue that we deal with the beginning of every school year. Residents need to be aware that parking your vehicle on a sidewalk is cause for your vehicle to be ticketed. Sidewalks need to be kept clear for the safety of the children walking to and from school. Violators put children and residents at risk by causing them to walk around the illegally parked vehicles and into these heavily travelled streets. Effective Monday September 9, 2013, City Police will be ticketing any vehicles that are illegally parked on sidewalks. Please be respectful of your neighbors and mindful of the safety of others by parking legally. Do you see that part that says "numerous complaints"? I'm pretty sure that was me, numerous times. And now I don't even have to go to a city council meeting! Woo! But I will remain vigilant, and I'm going to go down and check the status next to park on the busy street when there is a softball game, because the cars LINE the sidewalks on BOTH SIDES during the games. Or they did. Maybe they'll all get ticketed. We can but hope. Ann Marie will not let me have a napkin. Everyone else at the table can have a napkin, but whenever she sees me with a napkin, be it in my hand or on my lap, she says, "Nope!" and takes it and throws it on the floor. If she's not locked up in her high chair, she will then go to the linen closet and get me an alternative napkin in the form of a dishcloth or dishtowel, usually a dishcloth. Sometimes she wipes my mouth with it, thus ensuring I cannot put an unused dishcloth back in the closet. Again, please note that everyone else at the table is allowed to have a napkin, I, alone, am not permitted. Ann Marie give kisses - REAL KISSES - all the time, and it is the most delightful thing ever. Well, it is less delightful when I'm lying down and she climbs on me and presses her face onto my mouth so that I can feel her teeth with my lips and can't speak, but even then it's pretty amusing. The other night I was putting her to bed and she demanded that I keep my hand in the crib with her. That was a bit of a trial but then she suddenly gave my hand a loud smacking kiss before rolling over to go to sleep, so I let it slide. I signed up for a half marathon in October, so I've been running regularly. I don't talk about it much, but if you'll indulge me a minute, I ran 4 miles this morning and two of my three trips back and forth to school were with the stroller. In both cases, I had to push both girls home, which is uphill. (It's only uphill the one way, Dad.) School is about a half mile away, so I covered 6 miles today, and my feet hurt. On the way to pick up Jack, we ran into another parent on the way to school and the subject of sidewalk parking came up. It came up because Nora said, "We are on a mission to stop people from parking on the sidewalk!" Ahem. He agreed it was unsafe, though, and mentioned that he saw me try and fail to get by a car parked on the sidewalk. But I made contact with a city council member, and I think I'm going to go to a council meeting to plead my case. Interesting fact: In the email, she said she didn't want to mislead me and admitted to parking on the sidewalk for years and years on her narrow street in the city, but she said that the difference was that everyone who did it (which was everyone) made sure that there was plenty of space for a baby carriage. Perhaps. And honestly, I would not be on this crusade if people parked only slightly on the sidewalk, because the streets ARE narrow. But those who completely block the sidewalk have ruined it for everyone. The encouraging news, though, is that there was only the one car blocking the sidewalk. The situation has actually improved a lot since I started complaining. Andrew is coaching Jack's Under 8 soccer team, and was just reading the "Practice Suggestions" or whatever they're called, and the league suggests at least one and no more than two 90-minute practices per week, and says they should start at 5:30pm. Does this sound at all reasonable to any of you? These are six- and seven-year-old kids. Ninety minutes of practice? Really? And starting at 5:30? Even if you consider that the city public schools go from 9:00-3:30 (vs. Jack's Catholic school which goes from 7:45-2:15), it gets DARK in the fall at 5:00! Soccer goes till the end of October! We're supposed to have a bunch of seven-year-olds running soccer drills in the dark? For an hour and a half? Fortunately, Andrew is the coach, so Jack's team will be practicing at 5:00 for one hour, or until dark.